G. Masetti, “HydrOffice: Past, Present, and Future”, NOAA OCS Field Procedures Workshop. p. Portland, OR, 2018. G. Masetti, Wilson, M. J., Calder, B. R., Gallagher, B., and Zhang, C., “Research-driven Tools for Ocean Mappers”, Hydro International, vol. 22, 1. GeoMares Publishing, pp. 29-33, 2018. A. A. Armstrong, Owen, H., Bothner, W. A., Ward, L. G., and Moyles, D., “Shallow Water Multibeam Data Analysis of Complex Bedrock Geology in Penobscot Bay, Maine”, 8th Annual International Conference on High Resolution Surveys in Shallow Water. p. St. John's, NL, Canada, 2018. B. R. Calder and Elmore, P. A., “Development of an Uncertainty Propagation Equation for Scalar Fields”, Marine Geodesy, vol. 40, 5. Taylor & Francis Group, pp. 341-360, 2017. G. Masetti, Calder, B. R., and Hughes Clarke, J. E., “Methods for Artifact Identification and Reduction in Acoustic Backscatter Mosaicking”, 2017 U.S. Hydro Conference. The Hydrographic Society of America, Galveston, TX, 2017. J. A. Dijkstra, Norton, A. R., and Dijkstra, S. J., “Three-Dimensional Assessment of Seaweed Habitats Using Remote Sensing”, Coastal and Estuarine Research Federation. p. Providence, RI, 2017. C. Ware, “Averaged Propulsive Body Acceleration (APBA) Can Be Calculated from Biologging Tags That Incorporate Gyroscopes and Accelerometers to Estimate Swimming Speed, Hydrodynamic Drag and Energy Expenditure for Steller Sea Lions”, PLOS ONE. PLOS, San Francisco, CA, 2016. K. Mello, Dijkstra, J. A., Malik, M. A., Sowers, D., McKenna, L., and Lobecker, E., “Coarse and Fine Scale Patterns of Community Structure of Benthic Habitats Along the US Atlantic Continental Margin”, Benthic Ecology Meeting. Portland, ME, 2016. R. E. Grizzle, Ward, L. G., Fredriksson, D. W., Irish, J. D., Langan, R., Heinig, C., Greene, J. K., Abeels, H. A., Peter, C. R., and Eberhardt, A. L., “Long-term Seafloor Monitoring at an Open Ocean Aquaculture Site in the Western Gulf of Maine, USA: Development of an Adaptive Protocol”, Marine Pollution Bulleten, vol. 88. pp. 129-137, 2014. V. E. Schmidt, “A New Method for Generation of Soundings from Phase-Difference Measurements”, 2014 Canadian Hydrographic Conference. St. John's, NF, Canada, 2014. M. Grassi, Carmisciano, C., Cocchi, L., Dialti, L., Filippone, M., Guideri, M., Ivaldi, R., Masetti, G., Muccini, F., Pratellesi, M., Ricci, E., and Stefanelli, P., “Caratterizzazione dell’ambiente marino dei Campi Flegrei. Risultati preliminari della campagna oceanografica RICAMAR 2013”, 17a Conferenza Nazionale ASITA. Atti 17a Conferenza Nazionale ASITA, Riva del Garda, Italy, 2013. A. Berry, Cezairle, Y., Chowdhury, M., Englert, C., Gunasinghage , P., Guo, X., Hassan, N., Masetti, G., Minami, H., Nguyen, T., Thein, S., Welton, B., Wilson, M., Armstrong, A. A., Dijkstra, S. J., Smith, B., and Terry, E., “CCOM-JHC Summer Hydro 2012: A High-Res Survey Under 12 Flags”, Eighth Annual GEBCO Bathymetric Science Day. Venice, Italy, 2013. C. Fandel, “Observations of Pockmark Flow Structure in Belfast Bay, Maine”, University of New Hampshire, Durham, NH, 2013. B. R. Calder, “Parallel and Distributed Performance of a Depth Estimation Algorithm”, U.S. Hydrographic Conference (US HYDRO). The Hydrographic Society of America, New Orleans, LA, USA, 2013. L. McKenna, “Patterns of Bedform Migration and Mean Tidal Currents in Hampton Harbor Inlet, New Hampshire, USA”, University of New Hampshire, Durham, NH, 2013. A. Abramova, “Comparison and Evaluation of Global Publicly Available Bathymetry Grids in the Arctic”, University of New Hampshire, Durham, NH, 2012. G. A. Rice, Greenaway, S. F., Weber, T. C., and Beaudoin, J., “Methods for Collecting and Using Backscatter Field Calibration Information for the Reson 7000 Series Multibeam”, 2012 Canadian Hydrographic Conference. Niagara Falls, Canada, 2012. 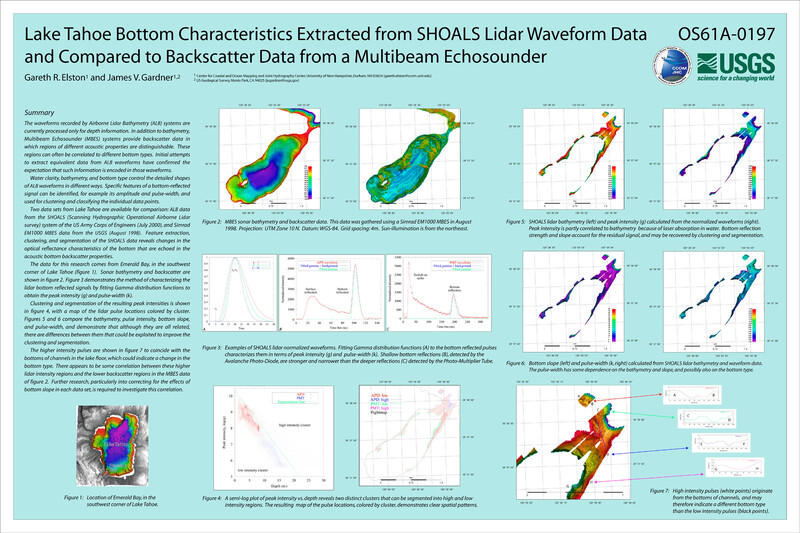 G. R. Elston and Gardner, J. V., “Lake Tahoe Bottom Characteristics Extracted from SHOALS Lidar Waveform Data and Compared to Backscatter Data From a Multibeam Echo Sounder”, 2002 Fall Meeting, American Geophysical Union. American Geophysical Union , San Francisco, CA, 2002. B. R. Calder, “Automatic Processing of Bathymetric Data from Multibeam Echosounders”, 2001 Fall Meeting, American Geophysical Union. American Geophysical Union , San Francisco, CA, 2001.